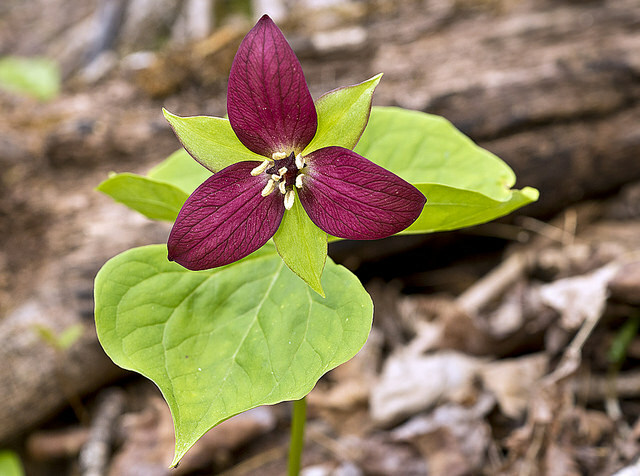 Wildflowers Part III: How Many of These Appalachian Wildflowers Have You Found? I’m amazed at the quantity and variety of wildflowers I’ve seen since moving to Western North Carolina ten years ago! It has become a game to see how many different kinds I can find . . . and remember. Because of the hundreds of wildflower species in our region, I’ll leave it up to you to acquire reference books and field guides, apps, and to search websites. To get you started, here are a few of the most common—and most interesting—wildflowers that I’ve seen that you’re likely to discover, too. 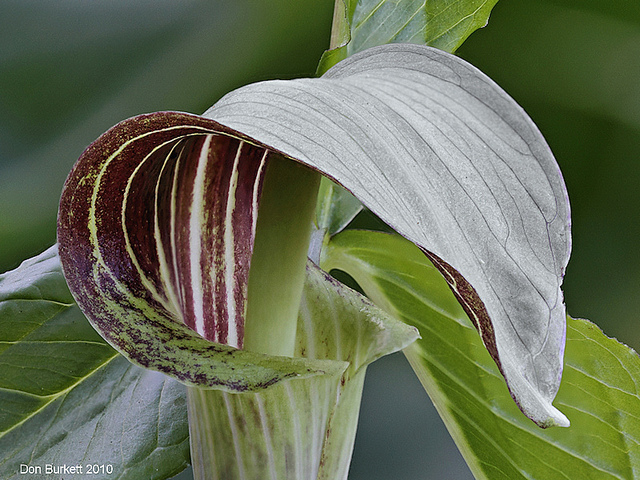 • Trillium (Trillium spp.) 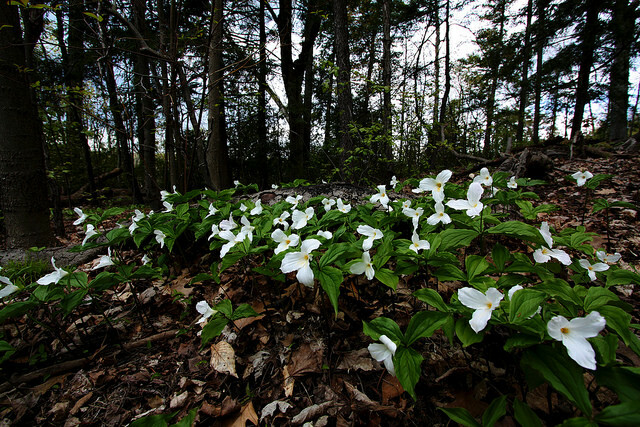 Three-leaved whorl and three-petal flower distinguish Trilliums. Our mountains harbor at least 10 species with fun common names such Wake Robin, Sweet Betsy, Nodding trillium, Toadshade trillium, and Painted trillium. Trilliums come in an array of blossom colors—white, pink, red, or yellow; solid-colored or speckled leaves; and blossoms that stand erect above the leaf whorl or hang below. • Wood anemone (Anemone quinquefolia). 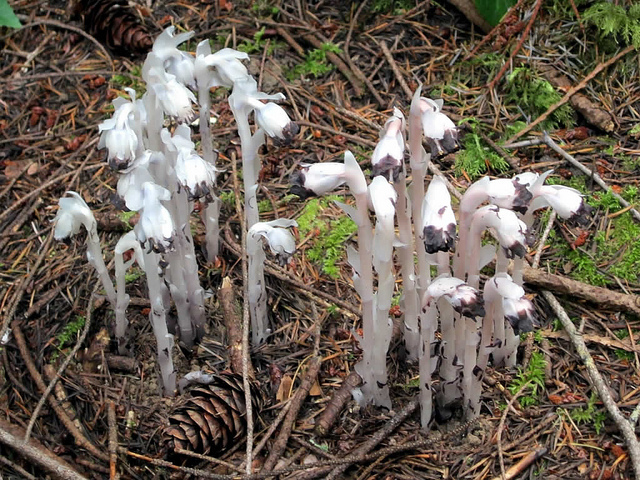 The flower “petals” are sepals colored white or pink. Wood anemones and the rue anemones (Thalictrum thalictroides [= Anemonella thalictroides]) are very similar, differing in the shape of their leaves and positioning of blossoms on their stems. 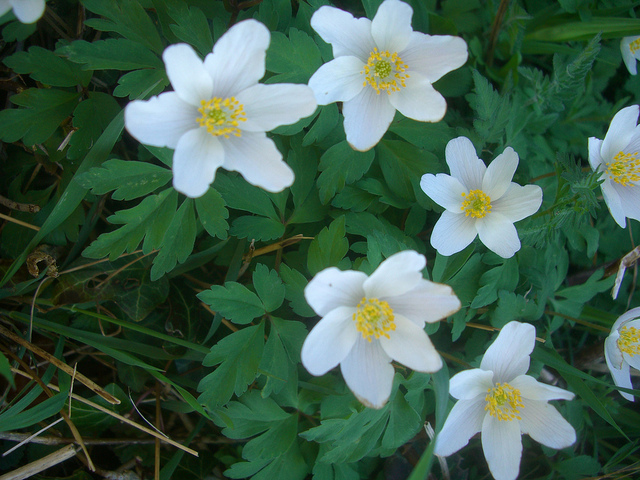 Rue anemones are sometimes called windflower, because they produce little nectar, but lots of wind-blown pollen. • Fire pink (Silene virginica). 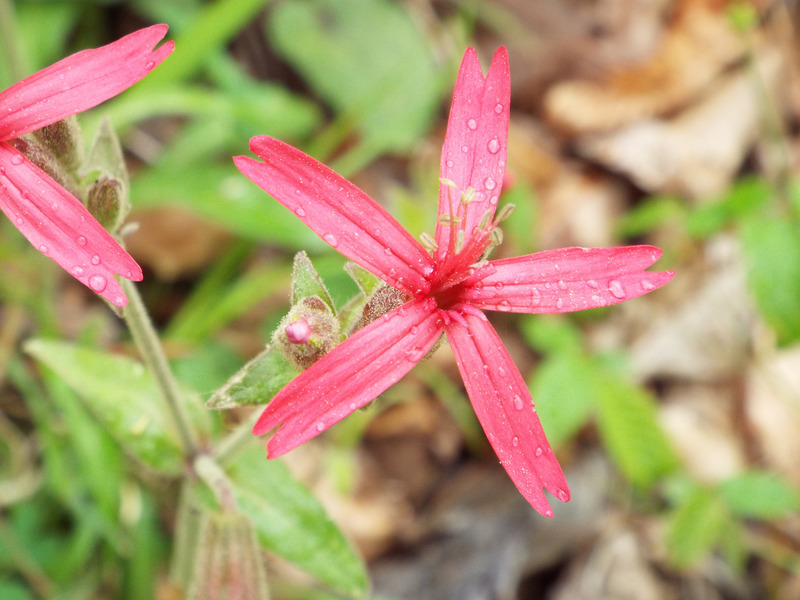 This wildflower’s scarlet-red five-petal blossoms—atop slender stems with narrow opposite leave—“pink” refers to the notched petals—“pinked” at their tips. 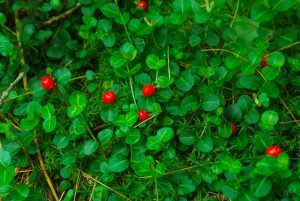 Fire pink is at home on harsh, dry, rocky slopes, although it will grow in well-drained, moist soils and partial shade. 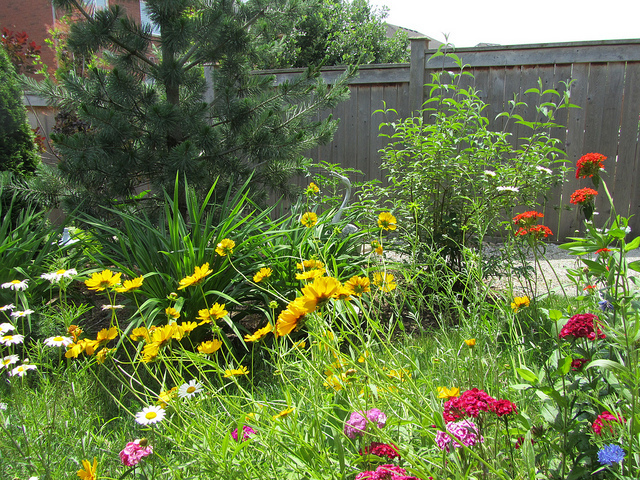 Pollinators and hummingbirds love it. Songbirds eat the seeds. • Mayapple (Podophyllum peltatum). 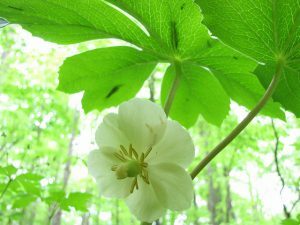 Look under the large, umbrella-like leaves to find the mayapple blossom, a solitary one-inch flower hanging at the fork of two leaf stalks. Growing in large colonies about 18 inches tall, Mayapples produce an apple-like yellow fruit. 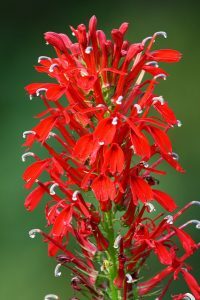 • Cardinal flower (Lobelia cardinalis). 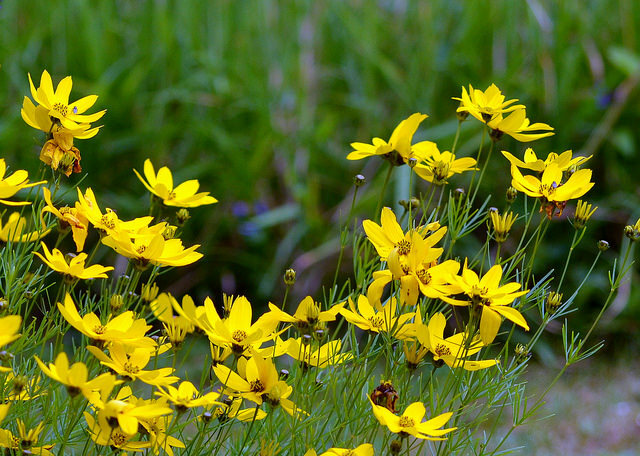 Like North Carolina’s state bird, the wildflower is named for its resemblance to Roman Catholic cardinals’ clothing. 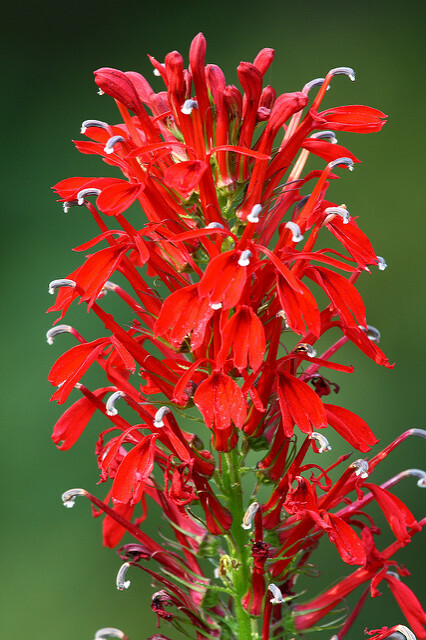 Growing 3-5 feet tall, with erect flower spikes atop each stem, cardinal flowers open from the bottom of the spike to the top. 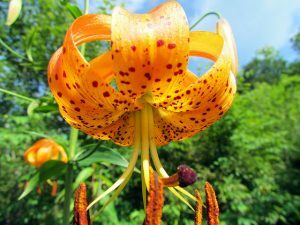 • Turk’s cap lily (Lilium superbum). This lily has up to two dozen orange-speckled flowers with backward-curving petals, looking like the caps ancient Turks wore. It can reach 9 feet tall! 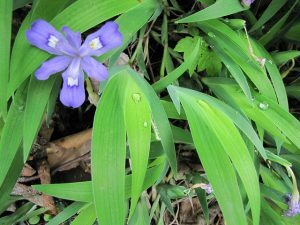 The smaller Carolina lily (L. michauxii)—North Carolina’s official wildflower—grows 2 to 3 feet tall. Both lilies have whorled leaves along their stems, but Turk’s cap has sharply pointed leaves—Carolina lily leaves taper to a blunt point. 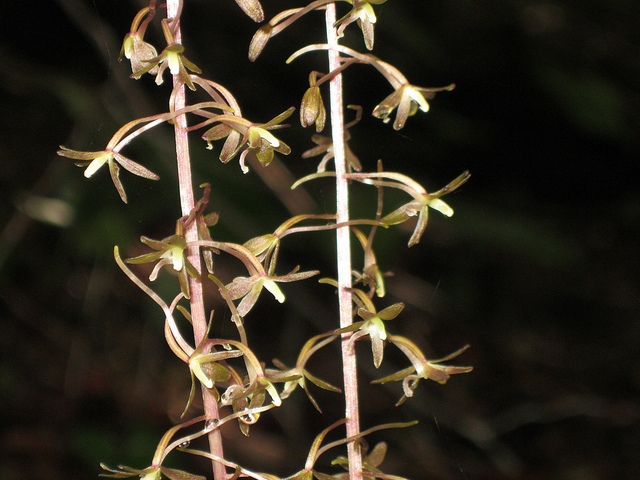 • Crane-fly orchid (Tipularia discolor). When this orchid blooms in late summer, with tiny whitish-brown blossoms along a 15-inch stalk, it has no leaves—but its distinctive, low-growing leaves emerge in autumn and persist until spring. Somewhat crinkly looking, their upper side is dull to shiny green, the underside is purple. 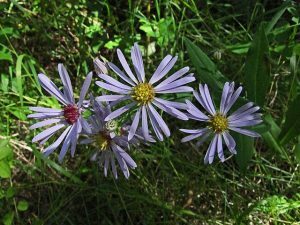 • Blue wood aster (Symphyotrichum cordifolium [= Aster cordifolius]). You’ll often spot these tiny blue flowers lighting up fall landscapes. 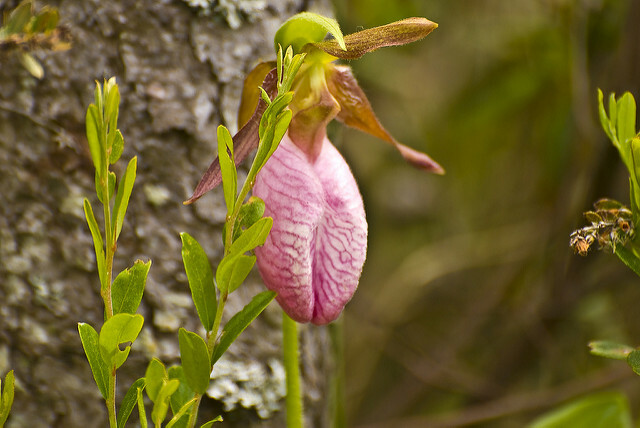 • Lady slipper (Cypripedium spp.). Discover this pink or yellow orchid, and you’ve found a jewel. The inch-long blossom looks like an inflated pouch or soft lady’s slipper. The pink lady slipper flowers on a stalk sitting above two large basal leaves. The yellow lady slipper has 3 to 5 leaves along the stalk. Their dust-like seeds require the right soil fungi to germinate. Never try to dig and transplant lady slippers! Enjoy them in their natural habitat. • Jack-in-the-pulpit (Arisaema triphyllum). You have to look carefully to see the flower that pops up at the node of one or two leaves, each divided into three leaflets. Look for the hooded pulpit and Jack (or Jill!) standing inside. That’s right, this wildflower can produce male or female flowers, depending on the amount of resources stored in its corm (underground stem). The pulpit can be green, brownish-purple, striped, or mottled. If the plant produces a female flower, red berries appear in late summer when both Jill—and the pulpit—are gone! Wildflowers Part IV discusses gardening with wildflowers. 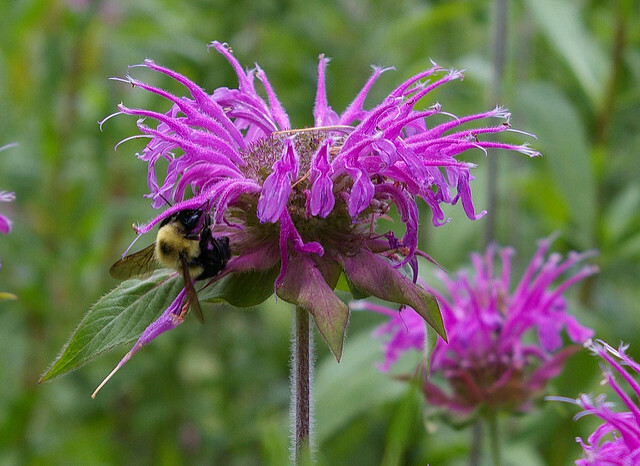 Photographs and searchable lists of wildflowers by common and scientific names. References, photographs, and searchable lists by state. Hike in the southern Appalachian Mountains, drive along the Blue Ridge Parkway, or visit the Botanical Gardens at Asheville, or the North Carolina Arboretum and you’ll find wildflowers in bloom virtually year-round. As we discussed in Wildflowers Part I, hundreds of species make their homes in our unique mountain environment. 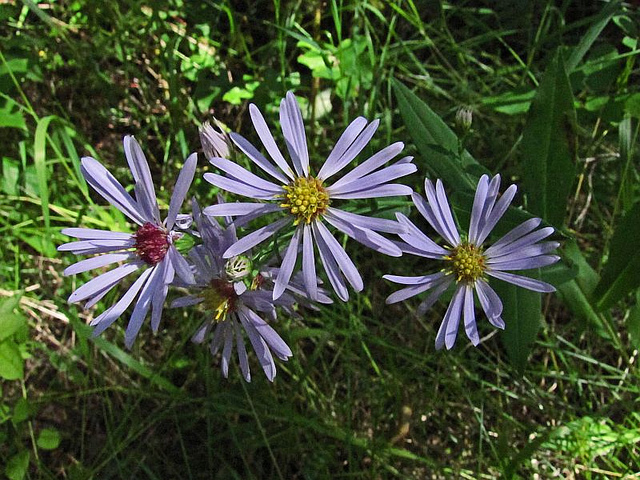 Some wildflowers are quite common and cover a wide range of elevations, like the many species in the Aster family. 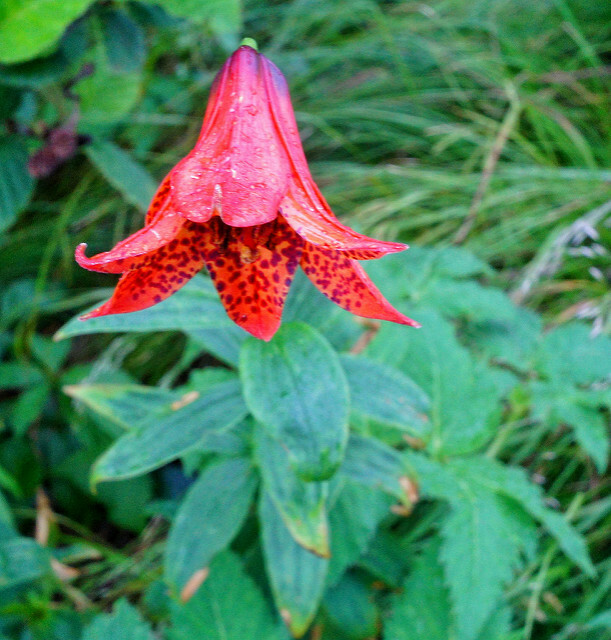 Others are very rare and endangered, such as Gray’s lily (Lilium grayi) and Rugel’s ragwort (Rugelia nudicaulis). While some wildflowers cling to rocky outcroppings, others prefer the nutrient-rich forest floor or a wet bank by a stream. Within a single genus, such as Trillium, you may find different species with blossoms in an assortment of colors—white, yellow, red, and multi-colored! The variety is almost endless. The fun is in the discovery. 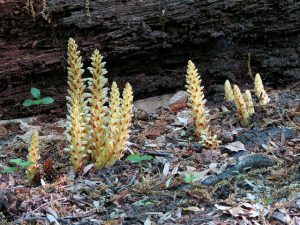 Botanists’ nomenclature for every plant part and shape enables them to identify and categorize plants—but paying attention to a few basic characteristics will help identify many wildflowers. Habitat. 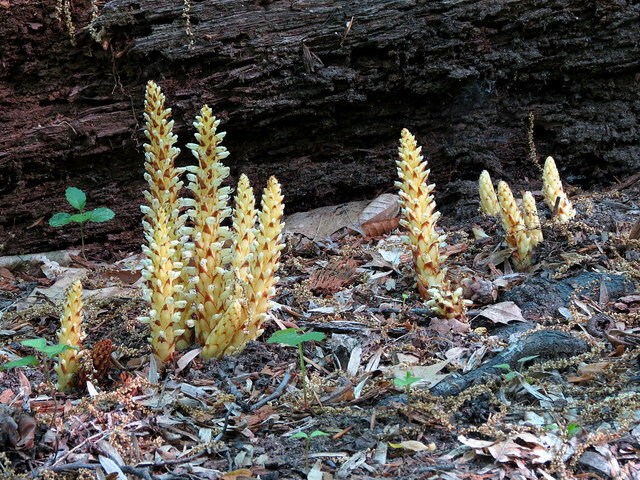 The process of elimination begins with observing the plant’s habitat. It’s unlikely you’ll find a pink turtlehead (Chelone lyonii), whose natural home is seeps and stream banks, on a dry, rocky slope! Assess habitat according to sun/shade, wet/dry, open area/woodland, and elevation. Flower. Consider color, number of petals, and blossom shape—single bloom or cluster; upward spike or drooping panicle; flat or rounded. Flowers can grow on different parts of the stem. Is the flower at the top of the stalk, growing from a joint between the leaf and the stem, or at ground level? Leaf pattern or arrangement. Wildflowers’ leaves are also important to their identification. Leaves may be basal (growing at the base of the stem next to the ground), opposite (growing in pairs on either side of the stem), alternate (alternating on either side of the stem), or whorled (more than two leaves growing in a circle around the stem). Some plants have both basal and stem leaves; others flower with no leaves at all! Leaf shape and margins. Basic leaf shapes are linear (long and narrow), lanceolate (lance-like), oblong, elliptical, ovate (egg-like), and cordate (heart-shaped). 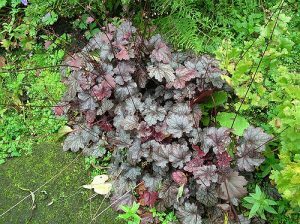 The margins or edges of the leaf may be smooth, serrated/toothed, or lobed/scalloped. A compound leaf may appear to be multiple leaves, but is a single leaf composed of several leaflets. 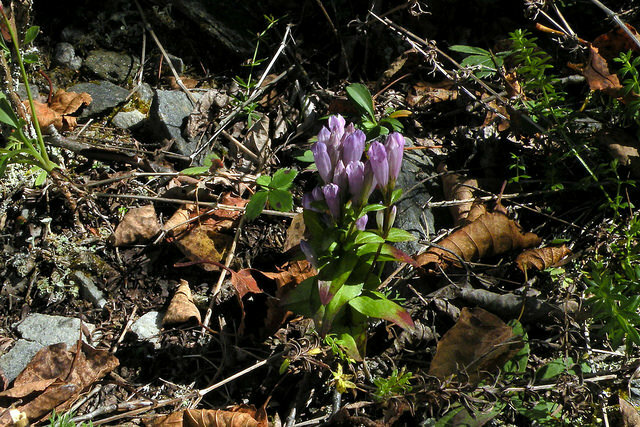 Now it’s time to match the characteristics you’ve observed with a high-quality wildflower reference. One of my favorites, Wildflowers of the Smokies, includes color photos, plant descriptions, bloom time, and typical location. Plant and wildflower identification apps are available for smart phones—even if you don’t have a reference app, phones are great for taking pictures of wildflowers to look up later. Make note of wildflowers you observe, the place, and the date. As you expand your knowledge of wildflowers, you’ll become more adept at finding and identifying them. With the establishment of state and national parks and forests in the 1930s, public appreciation and conservation of native plants and wildflowers began to take hold. Appalachian forests clear-cut for logging are recovering with government protection and help from conservation groups, but threats remain from non-native plants, insects, and diseases! Native plants lose the competition with exotic kudzu, Japanese stiltgrass, princess tree, and privet. Woolly adelgids attacks native hemlocks and emerald ash borers threaten ash tree species and the American fringe tree. Anthracnose kills flowering dogwoods. Humans who “over-love” our mountains pick or dig flowers, hike off-trail, and camp in undesignated areas. Poachers remove and sell conifer seedlings, perennials, and roots of the American ginseng plant. Article by Beth Leonard, Extension Master GardenerSM Volunteer. 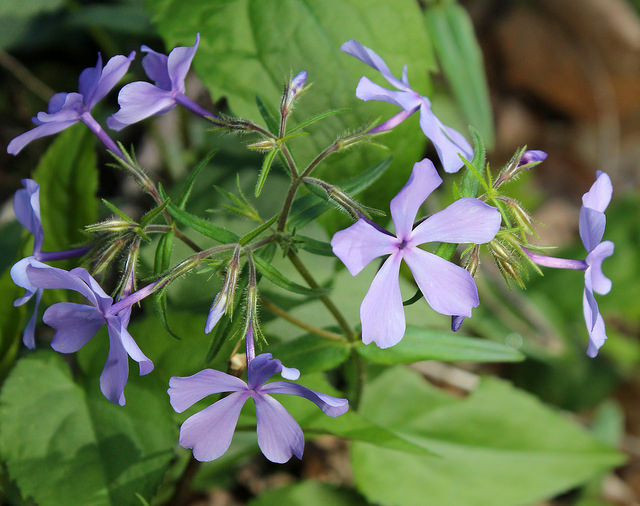 Wildflowers Part III describes a few of the most common southern Appalachian wildflowers. Alderman, J. Anthony (1997). Wildflowers of the Blue Ridge Parkway. The University of North Carolina Press. Spira, Timothy P. (2011). Wildflowers and Plant Communities of the Southern Appalachian Mountains & Piedmont. The University of North Carolina Press. White, Peter (2000). 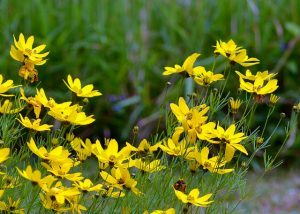 Wildflowers of the Smokies. Great Smoky Mountains Association.